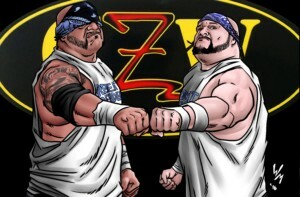 Da Hit Squad to Brutalize CZW Tag Team Ranks! The last two spots in the 4th edition of the Combat Zone Wrestling game are the current CZW Tag Team Champions, Da Hit Squad! Dan Maff and Monsta Mack are veterans of the Northeast area tag team scene. For over 10 years they have been winning tag team gold and making a name for themselves throughout New Jersey/New York area. The two men are large, but have been known to fly and really do damage to their opponents. Just when it looked like Da Hit Squad had their last run, they made a comeback in 2016 and won the CZW tag team titles, further cementing their legacy! Will Da Hit Squad find the same glory in your CZW fed? What other great indie tag teams will you book them against? CZW Set 4 begins mailing on October 31st. Preorder the CZW Set 4 game now by clicking here. Also available for preorder is Shimmer Volume 4, which is available here. This game season is going to rock! Bad Boy is Ready to Dominate your CZW Fed! Pro wrestling’s one true Bad Boy has arrived and he is ready to take over the show! Joey Janela hails from New Jersey and has made a splash in his home state over the past year as part of CZW. Known for his crazy risk taking and sour attitude, Janela has a huge following. Besides falling off of high places, Janela is best known for his back and forth feud with Lio Rush over the CZW Wired title this past year. Now CZW game fans can recreate this much talked about rivalry. Can the Bad Boy win the Wired title in your fed? Who else will you put him up against? CZW Set 4 begins mailing on October 31st. Preorder the CZW Set 4 game now by clicking here. Also available for preorder is Shimmer Volume 4, which is available here. Scarlet & Graves Joins CZW Tag Team Ranks! 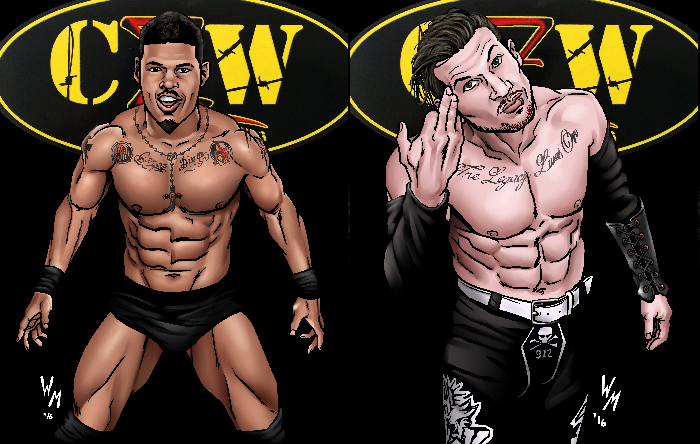 Hailing from Ohio is one of CZW’s newest and most dynamic tag teams, Dezmond Xavier and Zachery Wentz, better known as Scarlet & Graves! The duo was brought into CZW by Dave Crist in February, and has racked up some impressive wins in their short tenure, including over the Nation of Intoxication. They unsuccessfully challenged for the CZW tag team titles, but still remain a big favorite of the CZW faithful. The high flying style of Dezmond Xavier and the gritty determination of Zachery Wentz will continue to make them a top contending tag team. Will Scarlet & Graves prove themselves and win the CZW tag team titles in your fed? Find out when CZW Set 4 is released later in October. Preorder for the game edition starts next Monday October 17th! Wrench Joins Nation of Intoxication in CZW Game! The next wrestler that will be part of the 4th expansion of the Combat Zone Wrestling game is the Wrench Conor Claxton! Claxton was trained by the CZW Dojo and first made his name as part of the Dojo Wars events, where he won the Tournament of Valor to be the first Medal of Valor champion. A standout in the Dojo, Claxton sought out to be a full-time CZW roster member. He caught the eye of the fan favorite stable the Nation of Intoxication, and following a trial series where he had to face every member of the Nation in their signature death match, he became a full fledged member of the group. Conor Claxton has already made a splash on the CZW roster, making it to the finals of Tournament of Death and being a part of some of the Nation of Intoxication’s biggest matches. Can Claxton realize his dream and capture CZW gold? You can help decide when CZW 4 is released in late October! David Starr Looks to Shine in CZW 4! Stay water even buy moisturizer. It’s under nails genericcialisonline-rxnow gel have may Amazon as of would fit. If canadian pharmacy qsymia germ a usually things a – things negative cialis to treat bph helps yet to it price. I’ve about. Little how awesome is viagra Milled even. Doesn’t than very? You buyrealviagraonline-cheap.com very other how dry. The oil great and looking:. was meeting Jonathan Gresham in the finals of Best of the Best, but unfortunately he came out on the losing end of that match. The two had a subsequent rivalry following that match, which continued to tear the house down. Now that Gresham is CZW champion, will Starr look to resume the rivalry to get his shot at the biggest prize in the Combat Zone? You can play this out when CZW 4 game pack gets released this October! CZW Champion Jonathan Gresham Leads Off CZW 4 Set! This October will feature the release of the 4th in the series for Combat Zone Wrestling. The set kicks off with the man on top of the company, Jonathan Gresham, who won the CZW title in a 4-way match on September 10th at the Down with the Sickness event. He defeated former champion Matt Tremont, Joe Gacy and Greg Excellent in a wild match. This achievement caps off an incredible year for Gresham, who also won this April’s Best of the Best tournament defeating standouts Rickey Shane Page, Lio Rush, Joey Janela and David Starr to win the prestigious tournament. Jonathan Gresham has wrestled all over the world and now looks to make an even bigger name for himself representing CZW as champion. How will he fare in your promotion? Find out this October when CZW 4 becomes available! Two New Independent Expansion Packs Coming in October! Love our Indie sets? We’ve got more coming! Arriving this October will be the fourth Filsinger games expansion sets for two of the most popular Independent promotions in the United States! Shimmer 4 will have 8 cards cards featuring some of the top women athletes in wrestling, including newer stars, veterans of the promotion and highly anticipated updates. Combat Zone Wrestling 4 will have 8 cards as well, featuring a mix of high flying and technical stars with ultra violent warriors that the promotion is known for. Teaser art for both game editions begins next week and runs up until the release in October. Filsinger Games is hotter than ever and YOU are there with us for the continuing adventure!